In the Aerospace, Military and Space industries according the EN9120 standard. To see our certificate EN9120, click here. In other industries, according the ISO9001 standard. To see our certificate ISO9001, click here. We are very vigilant about products traceability, from orders to customers invoices (manufacturer’s batch numbers, test reports, certificate of conformity if needed – to be required at the order). 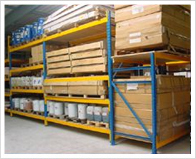 Our business premises offer a large storage place, wich staid at a continuous temperature, to provide a good preservation of the products. We also have a refregerated rooms able to keep any products at temperature bellow -18°C. A cutting machine, linked to our storage capacity, allows us to supply lower volumes, which cannot be delivered from manufacturers.